Socio-Political-Journal... : WILDFIRES in U.S., Portugal, Spain, Are They MAN Made? WILDFIRES in U.S., Portugal, Spain, Are They MAN Made? At least 31 people have died in a series of wildfires in Portugal, the country's civil protection service says. A spokeswoman for the agency told reporters that firefighters were still tackling 145 separate fires - dozens of which were still considered serious. Across the border in Spain's Galicia region, at least three people are dead. More than 50 people have also been injured on the Portuguese side of the border. Local media reports about the victims say several people are still missing in Portugal, including a one-month old baby, while in Spain, two of the victims were found in a burned-out car by the side of the road. Thousands of firefighters are battling the flames, which erupted across north-eastern Portugal and parts of Spain over the weekend after a hot dry summer. Conditions were worsened by Hurricane Ophelia, which is approaching Europe's western coast, bringing strong winds to fan and spread the flames. Rain is forecast for the affected regions late on Monday. In Portugal, a state of emergency was declared north of the Tagus river - about half the country's land area. More than 6,000 firefighters in 1,800 vehicles were deployed by early Monday morning. Galician leader Alberto Nunez Feijoo has claimed the fires were deliberately set by arsonists, in what he called "terrorist acts". 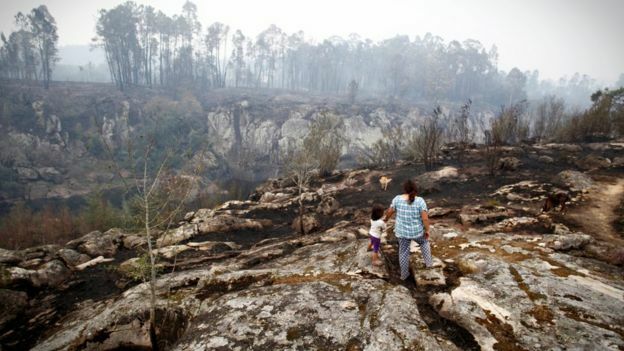 Interior Minister Juan Ignacio Zoido said several people had already been identified in connection with the fires, and appealed for anyone with further information to share it with the national protection service. Spain's Prime Minister Mariano Rajoy said he was travelling to Galicia, and expressed solidarity with the victims. The wildfires follow a massive forest blaze in Portugal in June which killed 64 people and injured more than 130. Firefighters tackling that blaze also alleged it had been started by a "criminal hand". But in the aftermath, questions were raised about the speed of the response and the readiness to tackle such a fire. 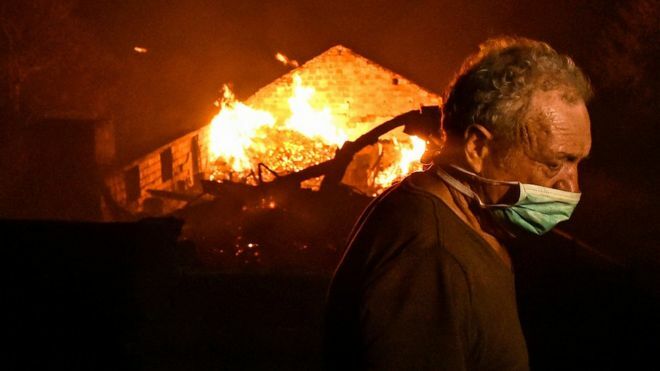 It also emerged that the country's rescue network, a public-private partnership, failed to connect several emergency calls to firefighters.